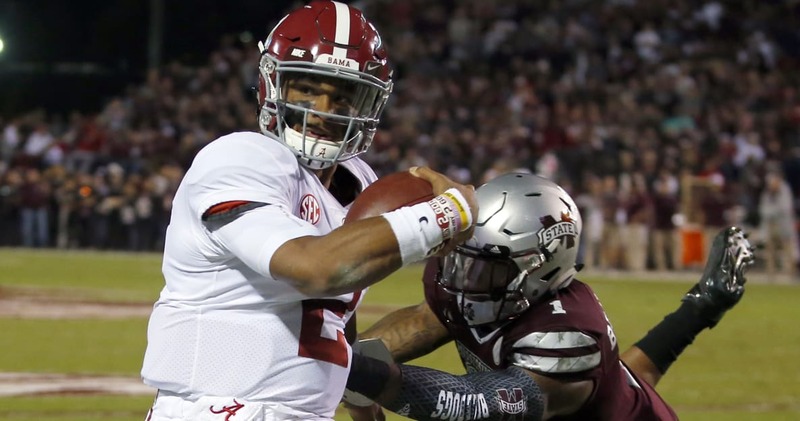 The stage was set for the mighty Alabama Crimson Tide to suffer their first loss of the season Saturday night. They were facing their own form of kryptonite in Mississippi State quarterback Nick Fitzgerald, a big, powerful mobile player with a good arm. Backing Fitzgerald was a defense that just might be able to slow down the Alabama run game enough for Mississippi State to do the impossible. 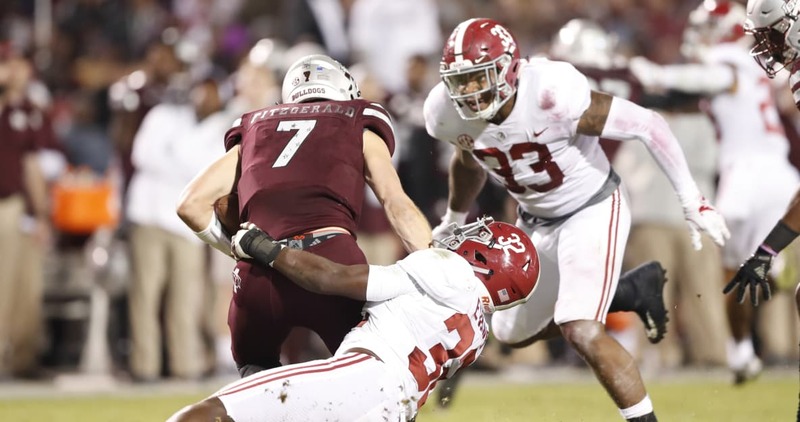 The perception, of course, was that the Alabama’s 83rd ranked pass game would not be up to the task against the Bulldogs ninth-ranked pass defense. That is if Mississippi State could slow down Alabama’s ninth-ranked run game, which they did. As it turns out—it was. Alabama’s kicker missed what would have been the go-ahead field goal with 2:03 left to play. The defense answered the call by forcing a three and out on Mississippi State’s next drive. When Jalen Hurts got the ball back in his hands, he had 1:01 to get the team in the end zone or field goal range. After starting with the ball on their own 33-yard line, it only took a couple of passes to Calvin Ridley to move to the Mississippi State 26. With 25 seconds on the clock, Hurts connected with DeVonta Smith for a 26-yard touchdown. The extra point gave Alabama a 31-24 lead. Nick Fitzgerald got Mississippi State to midfield with just enough time to attempt a Hail Mary. It didn’t work, but the refs threw a flag on Alabama for pass interference. So, he got another chance from the Alabama 34-yard line. But Fitzgerald failed to connect on that one as well. Alabama head coach Nick Saban wasn’t crazy about how his team struggled in certain areas. But overall, he was glad to see his team overcome some adversity. Mississippi State head coach Dan Mullen had hoped to get his first win over Alabama. But instead saw his record fall to 0-9. With Georgia losing to Auburn, the CFB Committee will move Alabama up to the No. 1 spot when the next poll comes out on Tuesday. The Crimson Tide will have an easy one on their hands next week against Mercer. But will have a battle on their hands to end the season against Auburn. Mississippi State didn’t have a chance to make the top four or the SEC Championship Game. A win would have just been a tremendous feather in their cap this season. They’ll likely remain in the top 25 when the new poll comes out. If Mississippi State can finish the season with wins against Arkansas and Ole Miss, they should be in line for one of the better bowl game.